If you have played sports at virtually any level from youth leagues to professional, then you have probably developed a few superstitions along the way that you would swear up and down make you a better athlete or at least make you perform better! As it turns out, according to some fancy pants sports psychologists, you were right! 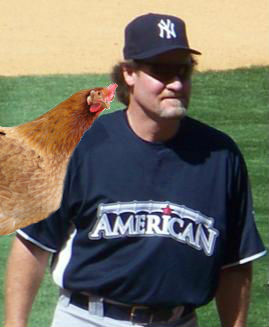 Whether it is Wade Boggs and his game-day chicken or Jason Giambi wearing a gold thong, there is an undeniable power of rituals in sports. According to Dr. William Wiener, “rituals are helpful in structuring athletes and helping them to prepare for competition… it insulates them from a lot of their own obsessive thoughts and from thinking about their nerves and what’s at stake in a given competition.” So it is helpful in focusing an athlete and calming his or her nerves. Another expert, Dr. Jonathan Katz, believes the key is to focus on the repetition without becoming obsessive-compulsive about a certain behavior. Indeed, OCD is particularly common in athletes who need to be obsessive to excel at their sport in order to compete. Superstitions can help this by providing structure for the obsessive behavior. In college, playing for URI club hockey, I sat in the same spot in the locker room for every practice and every game. Even today in men’s league, if I walk into the locker room late and my spot is taken, it puts me into a bad space immediately! If we lost a game, I would switch to new socks or a different tee shirt whereas if we won, I would not change a thing. Our goalie, who everyone knew not to talk to on game day, always listened to the same Rolling Stones album as he put on his equipment. I would bet the songs were synchronized with his dressing ritual. For more information on this topic, read this interesting article from Yahoo Sports! Nomar Garciaparra had his little glove dance at the plate and Michael Jordan wore his championship shorts from 1982 under his Chicago Bulls uniform…. so what is your ritual and does it help you?